My hometown, Shuyang, is known as "the land of flowers and trees". If you still do not know where Shuyang is, it’s the setting of the famous story "Farewell My Concubine”. Everybody in China knows this beloved concubine legend. They have sung and performed this story of loyal love for years and years. The famous concubine Yu was born in my hometown, Shuyang. I was very interested in the English language from a young age. I was very curious about the world outside China. I always dreamed of going abroad to have some experience of life in an English speaking country. I had a passion to speak, to learn, to understand the beautiful language. The only pity was that I actually did not have enough time to learn English as much as I wanted when I was in high school. Everyone has to learn a lot of subjects in order to get high examination scores rather than focusing on one subject. As soon as I went to university, the situation changed; I was in a freer studying atmosphere, which meant I could spend more time on English. I also learned interpreting (I passed the first part of SIA advanced level before I went abroad) during my spare time. During my four years at Nanjing University of Finance and Economics, my friends always thought I was too crazy about English. But I like reading Shakespeare and reciting those beautiful English poems. They are so nice, just like Chinese ancient poems. Why did you pick the UK? I appreciate many aspects of the UK’s culture, particularly literature, such as the works of Shakespeare. Also, the famous Chinese poet Zhimo Xu inspired me through his experiences in the UK with his work “Saying Good-bye to Cambridge Again”. Why did you pick Exeter? And finance? I had two offers at that time; Exeter and Southampton. In fact, two years ago, Exeter was not as good as Southampton. 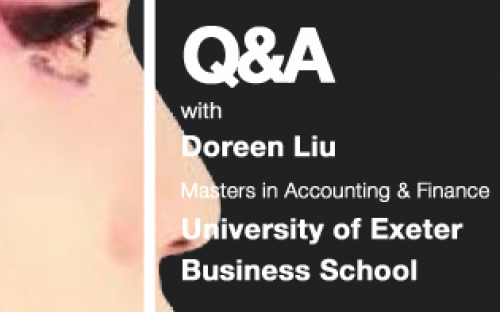 However, my teacher suggested to me that the University of Exeter was very good for Accounting and Finance. She said it would become more and more popular. This was true; the next year when I was in Exeter, it was ranked 2nd in the UK for Accounting and Finance. Overall, it is a top ten UK university (and it's better than Southampton now in the league tables), which is very good for students who want to study abroad and for UK students. What were the challenges and the highlights of your time at Exeter? English was definitely not as easy for me at the beginning as I expected. I thought my English was good enough to deal with everything. However, when the term began, I found it really hard to understand one of the lecturers during the first two weeks. He had a very strong accent. I was anxious at the beginning, because I was used to listening to standard BBC pronunciation, and I had no experience in any other accents. Gradually, things got better when I spoke to more people and got involved in different activities. After Welcome Week, I joined several societies: dance society, chapel choir, and international society. Each week I had some relaxing time to meet friends and enjoy different activities. It was a really good way to release myself from study and to improve my English. Who were your most interesting professors? I would definitely say it’s XuTong Zheng. His domestic and international portfolio management course (DIPM) is popular in the business school. I found the group project was really amazing. Different groups queue up to book a session with Bloomberg technology and spend lots of late nights working with it. We used Bloomberg to trace a portfolio of stocks for two months and gave a report/presentation on that. Our group got a prize for that project presentation. I was very happy not just because I was the main speaker but also because the great teamwork in the Bloomberg lab was really unforgettable. You can learn a lot through teamwork; you can share your feelings together and finally get to the objective you want. That project really gave me a lot of joy. What did you enjoy doing socially? The most interesting activity, I would say, was the country dancing during Welcome Week. It's a shame that it only happens once a year to welcome new students to Exeter. It is very traditionally presented. I enjoyed experiencing this traditional style of dancing. Any advice for Chinese students like you? I would say to Chinese students that if they want to study abroad, the UK is definitely a great place. However, they need to plan everything before they actually decide to go. And once they’re here in the UK they should apply for internships. This will help them to gain experience and find better jobs, either in the UK or in China.